To offer all students at all Socioeconomic Status (S.E.S.) levels rewarding and memorable Science, Technology, Engineering, Mathematics (S.T.E.M.) lessons at no cost to their school. Students are challenged to step out of their comfort zone by designing real-world apps using real-world data thereby gaining a better understanding of the real world. S.T.E.M. education need not entail the usual projects geared to a few hours or a few days. Instead, we offer High School students a one-year-long S.T.E.M. Laboratory class at no additional cost to the school, much less the student. This is especially the case given our patent endorsement that includes all S.E.S. levels. The only requirement needed is an Internet connection, which most schools already have. With a computer lab set-up in place, the S.T.E.M. class runs either as an elective or preferably as a typical High School technology class. In this light, students learn and use website development, word processing, spreadsheet, slideshow, drawing, and social media tools. The final website design rewards the students with a portfolio that encapsulates their learning for the year. An example of a student portfolio website can be found at: prototypesmda.blogspot.com. Surprisingly, from our experience flight testing prototypes of this class, students actually enjoyed doing all that hard work. However, if educators decide that they would rather have a one or two day project to augment their class, then they’re still in luck: we condensed the lessons into eight mini-lessons and published each one in our very own magazine. The magazine can be found as a free PDF download from our website. Check out the first entry in our Adventure series: Adventures in Outer Space. One of the major hurdles we have encountered in developing our lessons is that while the Middle Schools seem to have a lot of ways to get students excited about S.T.E.M., once they get to High School the opportunities to continue their education is lacking. Our model deals with this issue; the Middle School captures their attention, then we keep their interest alive in High School with our lab. Given our innovative S.T.E.M. model, the class is offered in various options, where student interest drives the curriculum. For example, a student who wants to become a marine biologist would take the Lab in the "Adventures Undersea" option. 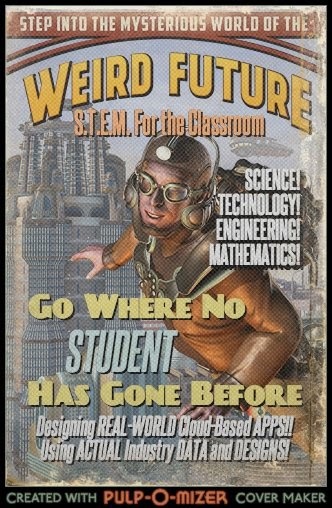 On the other hand, if the student wants to be an astrophysicist, then the option becomes "Adventures in Outer Space." Either way, the student learns the same S.T.E.M. skill set no matter which pathway is taken. From start to finish, students participating in this eight-tiered approach will be challenged to step out of their learning comfort zone, simply by designing realistic space missions using actual spacecraft data. It follows that they will then gain a practical understanding of Mathematics and Science. Students will use Google Technology as they play the role of "Cloud Software Engineers” where they will create space mission apps using Google Sheets; write and display their Engineering Journal using Google Docs; present their findings to the rest of the class using Google Slides; and embed everything in their own website using Blogger. Ensuing, students will use social media to demonstrate their hard work to their friends and family, who will proudly leave comments on the website, and who will in turn share the human adventure with the rest of the community. S.T.E.M. Labs: it's a win for the student, it’s a win for their parents, and it’s a win for our society! For more information on this important educational opportunity for high school students, please contact us using the email addresses listed below. Thanks!